Malvern and the surrounding area has a vibrant business community anchored by a number of larger companies such as Qinetiq, Malvern Instruments, SpellerMetcalfe, and The Morgan Motor Company. We have a growing list of the 'business to business' companies here, and have listed consumer-oriented companies under our Shops and Services section. If you would like to be listed here, or if you would like to increase your visibility in this listing by having your logo appear within a larger boxed entry please contact us. If you are travelling to Malvern to meet with one of these businesses, then you may also find the following pages useful for information about flights to nearby airports, details of trains and train tickets, and information about local petrol prices. Borwell - IT and software solutions provider for tracking business and process performance. Igence Radar - part of the software development specialist Igence focused on radar and sensor modelling, with capability to design and test new hardware for this sector. Pepperneck - integrated marketing agency that offers a range of services including PR, export marketing, and search engine optimisation. Rebecca Blake - direct taxation and accountancy advice and services for companies and individuals. Reflow - specialist in surface mount assembly of prototypes and small batch size electronic products. Textlocal - business bulk text messaging (SMS) solutions provider enabling businesses to reach their customers by mobile phone messaging. This enables companies and organisations to alert their customers to new promotions and news as well as sending reminders or confirmation messages. Complete with an on-line management system, marketing campaigns can be prepared, executed and monitored easily and cost effectively using an intuitive web-based interface. 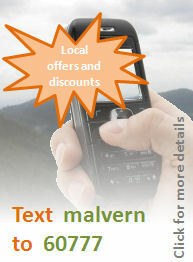 For more details, contact sales at txtlocal.com or telephone 0845 009 3180. WSI Internet Marketing - a full service Internet marketing and digital media agency providing optimised website and e-commerce systems. For more details telephone them on 01905 758 034. Malvern Hills Science Park - business premises in Great Malvern that hosts small and medium enterprises using science, technology and engineering to provide products and services. Malvern Small Business Forum - a group that meets monthly in Great Malvern for small business owners and entrepreneurs to network and share ideas or concerns. The programme usually includes a speaker who gives a brief presentation about their business or a provides an overview or workshop on a useful tool or methodology to help grow and develop an enterprise. 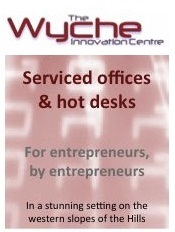 Wyche Innovation Centre - business accelerator and technology incubator situated in an inspiring elevated position on the western slopes of the Malvern Hills. The centre has hot desks and serviced offices suitable for small companies wishing to benefit from being able to mix with other like-minded entrepreneurs. Larger industrial bays suitable for research, development and light manufacturing are also available. With more personal data stored in the Cloud, homes networked for multiple devices, and Internet banking and shopping commonplace, a better understanding of computer security is paramount. This highly accessible book was written by local author Robert Rowlingson.